I have compiled my kernel several times and installed the modules. No errors were shown in the old terminal. I used GParted to enlarge my /dev/sda1 and I have set up a swap area, all done. 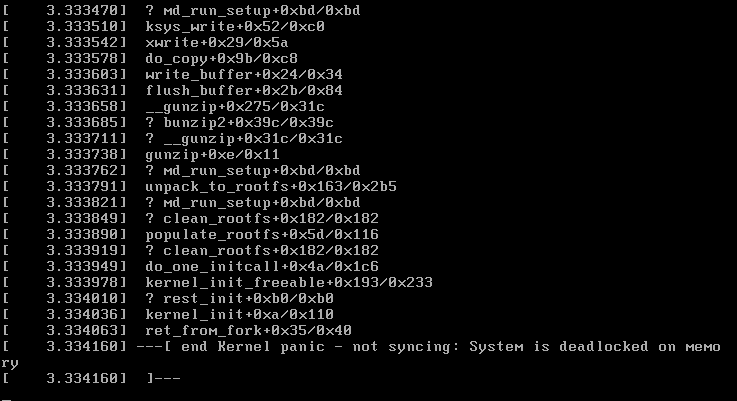 The stock Ubuntu 14.04 kernel boots fine. I can log in and use smoothly. and I have added it in the syscalls.h and syscall_64.tbl. I download Ubuntu 18.04,kernel 4.20.1(stable),I didn't change anything and run it again,the same error still showed up so I tried to enlarge my memory again, it works. I didn't realized it cause I have changed it from 1 G to 2 G before ,but it didn't worked, now everything is correct. Not the answer you're looking for? Browse other questions tagged ubuntu kernel compiling memory deadlock or ask your own question. Ubuntu 16.04.1: Kernel panic - not syncing: Attempted to kill init!